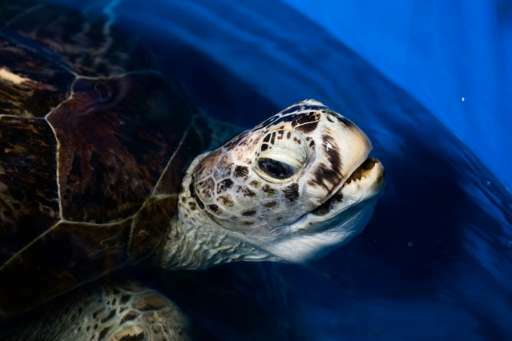 A sea turtle dubbed 'Piggy Bank' for swallowing nearly 1,000 coins took swimming lessons Monday as she embarked on a rehabilitation programme following the removal of the treasure trove by Thai surgeons. 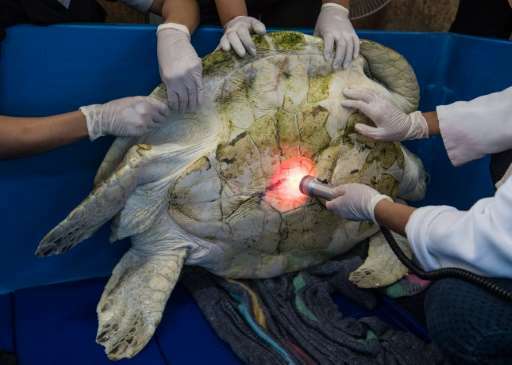 The hapless reptile underwent a seven hour operation in Bangkok last week to remove five kilogrammes (11 pounds) of coins from her digestive tract—good luck pennies thrown into the pool she swam in. The story of her plight and successful operation went viral, with headlines around the world. On Monday the 25-year-old turtle, called 'Omsin' (Piggy Bank), paddled around a small pool with relative ease. Nantarika Chansue, a vet in charge of Chulalongkorn hospital's aquatic research centre, said she was overjoyed by just how much movement Omsin had gained in her flippers since the operation. "Before this she didn't use her left side at all, because every time she moved it probably made it painful," she told AFP, as her patient splashed around. "Look at her now, she's fully using all the limbs very effectively." The troubled reptile lived for two decades in a small public park in Chonburi Province. Visitors tossed coins into her pond seeking to 'make merit' or good luck. Nantarika said the international media reports have had the added bonus of making Thais think twice about throwing coins into ponds where animals live. "Because of this, all the ponds that I know they are cleaning up their ponds, pulling out all the coins, putting signs up that there is no throwing coins," she said. Chulalongkorn vets say they hope Omsin will one day be able to return to the sea given she could easily live for another 60 years. First they will teach her how to swim and then how to dive—a task that requires her to build up lung strength. Then they will take her for swims in the ocean using a specially designed "turtle-leash" that allows researchers to reel her back in. Asked whether she will know how to swim in the deep blue, Nantarika replied: "Of course. It's like us being in prison for twenty years, you know, we still know how to live our lives, so I believe that the best way is to let her go."